“I like to build stuff, but I also really like to figure out why things break, says Angela Leimkuhler Moran in describing her role as a Materials Engineering scientist at the U.S. Naval Academy where she conducts research to help assure that metals and other material that make up some the Navy’s most vital equipment (such as aircraft, sea vessels and weaponry) can withstand the stress and demands of their use. Those days are not far from her mind as Angela today inspires other kids to pursue careers in science, technology, engineering and math. Despite her busy schedule at the Naval Academy in Annapolis, MD – where she also serves as faculty professor in the Mechanical Engineering Department, teaching Design, Manufacturing and Materials classes to midshipmen – Angela conducts intensive outreach programs at the academy in science and engineering for elementary, middle and high school students. Her outreach has touched youngsters in virtually all 50 states and Guam. Looking back on her life, Angela says it was her deep curiosity about the inner workings and construction of things, in addition to a love of math and science, that motivated her to pursue Materials Engineering, a challenging technological field which studies the properties and applications of a wide range of materials (including metals, plastics, carbons, ceramics, semiconductors and polymers) at the molecular and macroscopic levels. The importance of this field cannot be understated since virtually everything we come in contact with each day – from the cars we drive to the cell phones we use – is made up of complex materials. Scientists in this field are especially interested in how such materials can be further developed and enhanced to meet technology’s ever-changing demands. Angela received her Ph.D. and M.S.E. 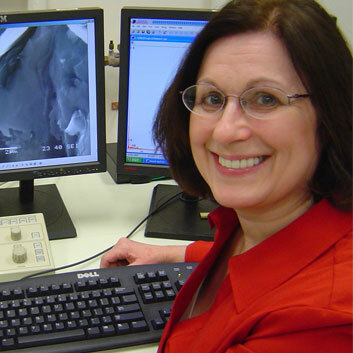 degrees in Materials Science and Engineering from The Johns Hopkins University, and her B.S. degree in Physics and Engineering from Loyola College.